Veteran forward Sam Gagner was surprised to find that he would not be starting the season at the NHL level after the Vancouver Canucks waived him and subsequently assigned him to the AHL’s Toronto Marlies prior to the start of the 2018-19 season. However, Gagner got the call from the injury-plagued Canucks in mid-November and saw it as an opportunity to win back his job with Vancouver. Gagner’s efforts were clearly not enough, as the team announced today that they have returned Gagner to the Marlies. In seven games in Vancouver, Gagner played a pivotal role for the Canucks, averaging more than 18 minutes of ice time per game. In fact, in his last game on Saturday, Gagner logged more than 19 minutes, among the Canucks’ top skaters that night. His ice time also included a healthy amount on the power play, where he has always been effective. Altogether, Gagner only recorded three points – a goal and two assists – but was crippled by a 5.9% shooting percentage that would currently go down as the lowest of his career and is far from the norm over his twelve seasons. Nevertheless, three points in seven games is far from overwhelming and Gagner was a non-factor defensively and a liability at the face-off dot during his brief call-up. Gagner could certainly be of benefit to Vancouver this season, but he certainly did not do enough to force their hand in keeping him, especially with trade acquisition Josh Leivo incoming and Jay Beagle getting close to a return. The question now is whether or not Gagner improved his stock enough during the recall to rejuvenate his trade market. The likely end to Gagner’s time in Vancouver became a trade as soon as they waived and reassigned him earlier this season. A solid player with years of success at the NHL level, few believe Gagner should be relegated to the minors full-time, but no teams were willing to take on his full contract via waivers. After seeing him play big minutes again for the Canucks, as well as point-per-game production in the AHL, it is possible that competitors could begin putting in calls to Vancover GM Jim Benning. 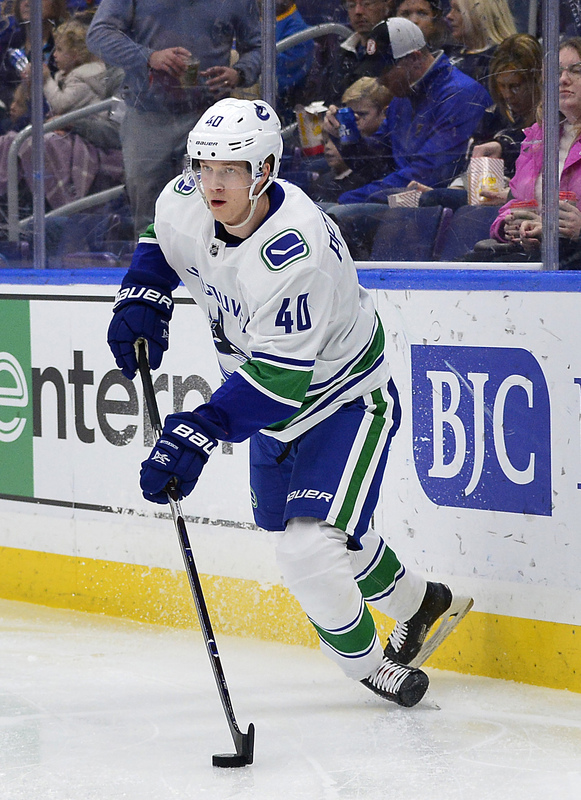 The Vancouver Canucks already lost Elias Pettersson for a week with a concussion, but that won’t be the only player they’re missing for the next while. Jay Beagle will be out for six weeks after suffering a broken forearm this weekend. Beagle blocked a Mike Hoffman blast from the point late in the game against the Florida Panthers, and won’t be able to help the Canucks as they look to stay competitive in the early going. Beagle, 32, was one of the free agents that the Canucks decided to sign this offseason to insulate their young lineup and provide some experience to the roster. Given a four-year contract, many questioned if he would be able to remain effective after leaving a specific role he’d served in with the Washington Capitals. Beagle had been a defense and faceoff specialist in Washington, suiting up behind Evgeny Kuznetsov, Nicklas Backstrom and Lars Eller as part of one of the deepest center groups in the league. Now in Vancouver he had been asked to do little more than that through the first five games, and had incredibly seen almost exclusively (92.6%) defensive zone starts. That role will now have to go to someone else while Beagle heals. The team will also be losing their prime penalty killing forward, as Beagle had seen almost five minutes a night short handed through five games. Though not asked for much offense, Beagle had been showing he could at least be relied upon for what the Canucks wanted out of him, something they’ll need to find elsewhere now. A team that has gotten off to a good start will need other players to step up in the absence of their injured forwards and hopefully keep the Vancouver train rolling towards playoff contention. The Washington Capitals have that unusual circumstance where they are coming off winning the Stanley Cup, but are also breaking in a new coach. With Barry Trotz headed to New York, the team replaced him with long-time assistant coach Todd Reirden. NHL.com’s Tom Gulitti writes that the new head coach intends to make some changes to a team that returns everyone with the exception of fourth-line center Jay Beagle and backup goaltender Philipp Grubauer. Reirden, known as a players’ coach when he was an assistant, says that he believes that connecting with players is critical of being a coach and said he doesn’t intend to change now that he’s finally got his chance to be a head coach. The New York Rangers’ Vitali Kravtsov was named the best forward at the 2018 U20 Four Nations Tournament with a goal and three assists in three games. The 18-year-old was the ninth overall pick by the Rangers in this year’s draft and is expected to return to his KHL team, Traktor Chelyabinsk, as he signed a one-year deal there. The hope is Kravtsov will be ready to compete for a spot on the Rangers roster next season. Minnesota Wild’s Simon Johansson was named top defenseman, while Detroit Red Wings’ Jesper Eliasson was named top goaltender. The Calgary Flames have made quite a few moves this offseason in hopes of reshaping their roster after a dismal second half that saw them out of the playoffs. However, the Flames new signings may have caused other issues that the team will have to deal with in a few years — namely the expansion draft. The Athletic’s Kent Wilson (subscription required) writes that the team might be in trouble if/when the unnamed Seattle franchise has its expansion draft in 2020. Assuming all the rules are the same as they were for Vegas, Calgary will have a logjam of players at the forward position and won’t have enough spaces to protect some quality players. Assuming there are no changes among forwards over the next two seasons, the team would likely protect or have to protect Johnny Gaudreau, Sean Monahan, Elias Lindholm, Mikael Backlund, Matthew Tkachuk, James Neal as six forwards they would likely protect. That would leave one spot open for players like Derek Ryan, Mark Jankowski, Sam Bennett, Andrew Mangiapane and Spencer Foo, which could leave several high quality players exposed to Seattle. Unless the team addresses these issues, the team may be giving Seattle a solid player. J.D. Burke of The Athletic (subscription required) writes that he believes that Vancouver Canucks center Bo Horvat should continue to take his game to a new level as he has every year. However, if there is one area of Horvat’s game that could use some upgrading it would be his defensive game as that’s the weakest part of his game. The 23-year-old took his scoring game up a notch last year when he potted 22 goals, an improvement on his previous career-high of 20 goals, but Horvat missed 15 games last year, so to put up a career-high in goals is key. However, with the additions of players like Jay Beagle, Antoine Roussel and Tim Schaller, maybe defense won’t be that imperative.